One of the most challenging projects is the TRY CROSSOVER BULLI. The mobile messenger for the TRY CROSSOVER vision: When passion and creativity gather in a collaborative environment, limitations vanish. Within two years around 100 young people, supported by 10 specialized companies, transformed a worn out Volkswagen-Bus into an up-to-date Electric Vehicle. 300 kilometers independence and 7.5 seconds from zero to 100 km per hour set the benchmark, not only in performance. If you can dream it, you can do it. The Bulli rolled to Italy, used as a rolling stage for the Guten-Abend-Band performing in public areas. It was shown on several shows and attracts people, wherever it stops. But there are dreams, waiting to become reality. One is the transformation into a mobile stage for performances. As a first use case, in 2017/2018 the foldable band stage was developed in cooperation with the University of Applied Sciences in Rosenheim/Germany. Based on the idea to perform ad hoc concerts anywhere you want, the students created a stage, using light high tech material that can quickly be unfolded from the inside out to a stage where the instruments are plugged in within seconds to get the band ready to rock. The next dream is, to rock by cooking. Nils Holger Moormann, famous furniture designer and expert for camping-bus interiors, came up with the idea to create a kitchen-set for the Bulli. After an initial brain storming project we decided to go for a stunning outdoor kitchen set up. To utilize the on board electric power luckily BORA joined the project and provides its best in class cook tops. Interested? No question. 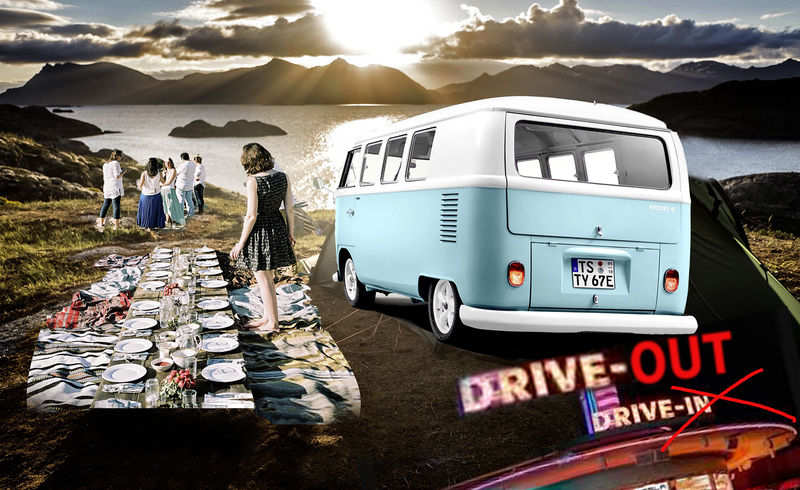 Click here http://try-crossover.de/projekte/bulli-rolling-kitchen.html and create the Bulli-Drive-Out-Vision!